I have very fond memories growing up of my mom buying a whole chicken to make her Chicken and Noodles. The shredded chicken, homemade noodles cooked in the broth, and mashed potatoes. Just thinking of the salty meat, smooth potatoes, and al dente egg noodles makes my mouth water. Its one of those recipes you can duplicate but just never tastes the same as Mom’s. Even though I grew up seeing the whole bird preparation, it’s still a little intimidating when the first raw bird is sitting in front of you. This intimidation is why many people never try, which is probably why you can find them so cheap! A few times a month they go on sale at my local health food store. A 5 pound chicken for $5 is a great deal. Throw it in the freezer if you can’t make it the same week (just defrost before starting the recipe below). 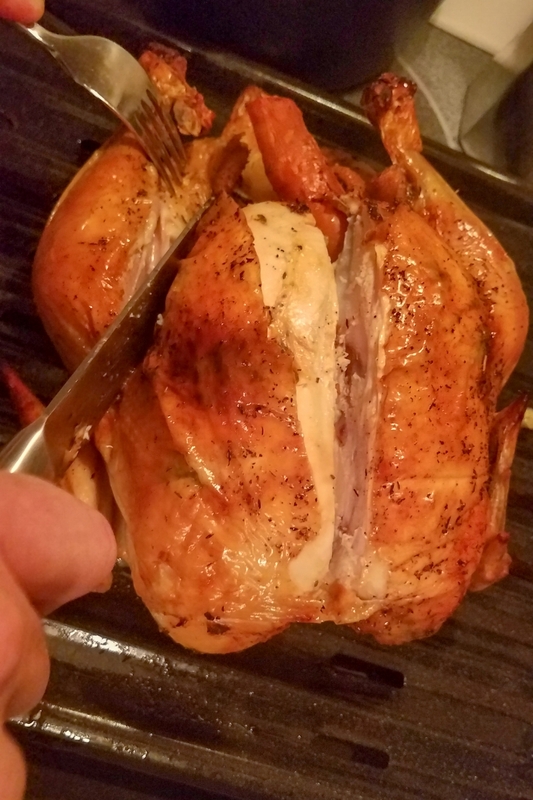 Roasted chicken makes wonderful leftovers and if you have a large family, it is just as easy to roast two chickens (just double the ingredients)! If you season the bird with basic flavors, which is what I’m using in this recipe, it is easy to reuse the meat for different types of meals throughout the week. If you are reading this the week it posts, I bet you can guess what Culinary Collaboration #2 will include! Grab a glass of wine and lets roast a chicken! Actually, I would wait to pour the wine because your hands are going to get a little messy. Recipe Notes: The brine ensures you don’t have to stress about drying out the bird. Even if you can only soak it for a couple hours, its better than nothing! Make sure to get the spices under the skin without removing it so the meat itself is flavored rather than just the crust. The water needs to be cold so wait until room temperature or add a little ice to speed up the process. Reach inside the cavity and remove the innards. These typically come package inside but make sure to take out anything loose inside and discard. Place chicken inside a container big enough to hold chicken and brine. I find most chickens fit in a large ziplock. Pour the brine into the container with the chicken, making sure the cavity is filled, and place in the fridge for at least 2 hours but overnight is best. Using hands, lift the skin near the edge of the breast (usually there is a hole or easy place to make a tear) and spread the spice mixture as far down as possible without ripping off the skin. We want to season the actual meat, not just the skin. Repeat the process with the thighs. You may have to flip the bird over to get to the thighs. Don’t bother with the wings as the skin doesn’t stretch enough. Once you’ve seasoned the meat, set the bird on its back, breasts facing upward. Using baking twine, tie the legs and wings down near its body as shown in picture. Add more olive oil to the seasoning bowl. Place thermometer in chicken in the breast (making sure not to hit a bone) and wait. You want the breast to hit 165. If the skin is getting too dark, cover with aluminum and continue to cook until breast registers 165. Once removed from the body, cut joint between drumstick and thigh to separate the two pieces if desired. Remove each wing by pulling it away from the body and cutting the connecting joint. You can now assemble on a platter (as shown on the right) or you can carve up the meat for consumption. Just like a steak, slice the breast meat against the grain to maintain the tenderness of the meat. For a chicken breast, cut on the width, not the length of the breast.